The BASIC stair cart is the ideal aid for transporting goods up steps. The 3-armed wheel centre enables you to overcome steps with a height of up to 200 mm. 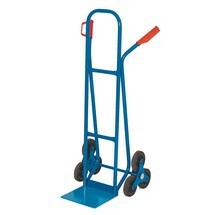 The material of the transport cart is either aluminium or powder-coated steel.